Contractor will be closing alternating lanes on NB and SB I-15 on Monday through Friday December 3 to December 7 from 9 p.m. to 5 a.m. A minimum of one lane will remain open in each direction at all times. Contractor will be installing temporary bridge support structures Friday, November 30 and Saturday, December 1. Full freeway closures will be taken as noted on the schedule below. The contractor may have to change closure nights because of the rain forecast for the area over the weekend. Placing the temporary support system over the I-15 freeway will allow the contractor to begin constructing the new south Limonite bridge. Update: Contractor successfully installed the temporary bridge support in its entirety on Friday night, so no further closures on this notice will be required. Full closure of Limonite Ave. Contractor will be working on construction stages 1C. Field activities will consist of abutment forming, CIDH pile drilling/pouring, roadway excavation for ramps, retaining wall excavation, and Limonite road work. The electricians will be installing falsework lighting next Mon & Tue and will be taking a single lane closure and closing a single lane on Limonite Ave. (one direction on Monday, both directions on Tuesday) and perhaps one ramp closure (NB off) on Tuesday. One lane will always remain open on Limonite Ave. in each direction. No closures are anticipated this week. Night of October 26 only. Alternating lane closures on NB and SB i-15. Closure of NB off-ramp from 9 PM to 5 AM. Night time emergency closure of the NB off-ramp from 9 PM to 5 AM. Closure starting on 10/17 to 10/19. Contractor will be working on construction stages 1C. Field activities will consist of abutment excavation, CIDH pile drilling/pouring, roadway excavation for ramps, retaining wall excavation, and Limonite road work. Contractor will be working on construction stages 1C. Field activities will consist of abutment excavation, CIDH pile drilling, roadway excavation for ramps, retaining wall excavation, and Limonite road work. Contractor will be working on construction stages 1C. Field activities will consist of south side of bridge demolition, abutment excavation, CIDH pile drilling, shoring, roadway excavation for ramps, retaining wall excavation, and Limonite road work. Update: Demolition work was completed Saturday night September 15. There will not be a freeway closure on Sunday night, September 16. Previously scheduled ramp closures are still in effect. 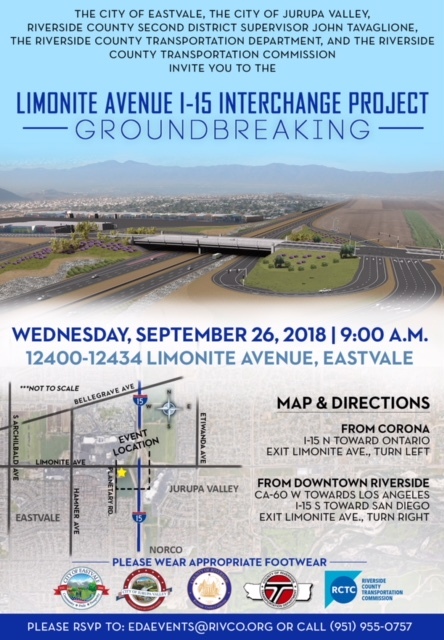 Contractor started construction on the Limonite Avenue Interchange Project on August 23, 2018. Field activities will consist of demolishing the south side of the Limonite Avenue Bridge over the I-15 freeway. Monday night, September 10, traffic on Limonite Avenue will be switched to the north side of Limonite Avenue. Traffic will remain in this configuration until the south side of Limonite Bridge is reconstructed. *Update: The full freeway closures have been moved to Saturday night, September 15 and Sunday night, September 16. Contractor will be working on construction stages 1A, 1B, and 1C. Field activities will consist of paving temporary loop ramps, Limonite Ave re-striping and k-rail placement, installation of bridge shoring and falsework erection, retaining wall excavation, and Limonite road work. This short video shows current conditions before the start of construction on the I-15 / Limonite Avenue Interchange Improvement Project. As construction continues, we will continue to post updated videos and photos, so that you can observe the progress of the construction activities. Work is scheduled to begin August 23. Stay tuned for more details.